Paramount and Nickelodeon’s latest effort at a family friendly action flick, Monster Trucks is a work that while not a monster failure, is anything but a monster success. Originally released in theaters this past January, it was just recently released on DVD and Blu-ray on April 11. It fails to run on all eight cylinders in part because of its story, which suffers from some major writing issues. While the story does suffer from some undeniable issues, it isn’t a total loss. That is thanks to the work of the movie’s cast. This will be discussed later. The movie’s balance of special effects and live action elements is another notable element worth discussing. Together with the work of the movie’s cast (which clearly is not a group of teenagers, save perhaps for one cast member), the two elements are just enough to keep Monster Trucks’ engine running, albeit not on all cylinders. Paramount and Nickelodeon Films’ new high-octane family action flick Monster Trucks is an entertaining watch. However, it is a movie that clearly does not run on all eight cylinders. That is due in large part to a story that is marred by a plot hole *ahem* large enough to drive a truck through and a story that is anything but original in its setup. The plot follows high school student Tripp as he fights to save a friendly mutant half shark/half octopus from the clutches of an evil oil drilling company and get it back home. The problem with this story is that he does this while driving a late-model truck that normally would be a gas guzzler. The movie’s defenders might try to argue that putting the creature in place of the truck’s engine was a subtle way to argue in favor of alternative energy. Odds are though, that the movie’s writing team did not exactly have that message in mind when they came up with the movie’s script. Odds are they didn’t even begin to think about this plot hole at all and just thought it would make for a good way to bring in young audiences because it had monsters and trucks. That is just one of the problems from which this movie’s story suffers. It also suffers from a setup that is anything but original. The setup for this movie’s story sees a young person (or at least what is supposed to be a young person—obviously played by someone who is not a teenager in this case) saving a harmless creature from an evil heartless corporation. In case that doesn’t sound familiar to anyone out there, similar story lines have been put forth in E.T., Free Willy, Pete’s Dragon, Super 8, and so many other movies. Given the plots are not mirror images. They are close enough though, that the comparisons are undeniable. Considering this and the problem posed by the movie’s massive plot hole, the movie’s story is a major problem for its overall presentation. Even with the problems posed by its plot hole and its setup, the movie is not a total loss. It just takes a big hit. The work of the movie’s cast is a saving grace in examining its overall presentation. 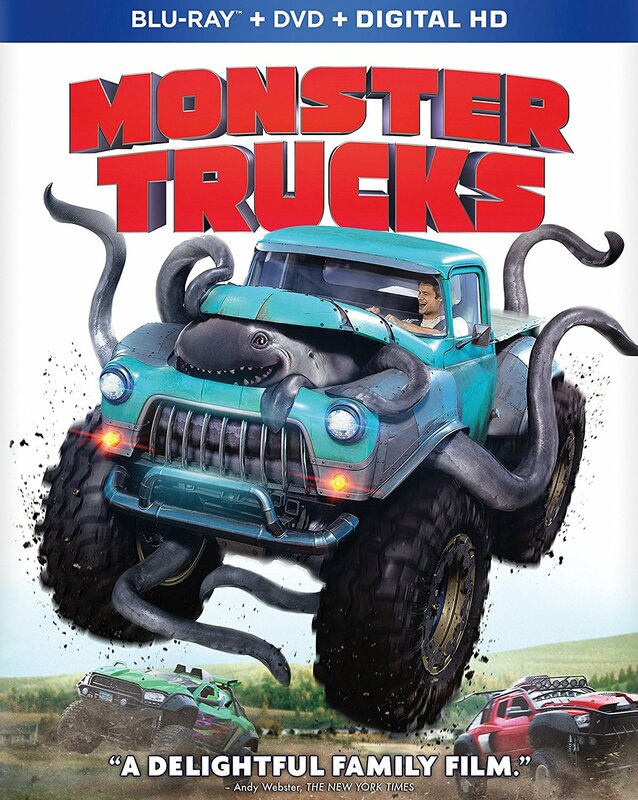 Monster Trucks’ cast is obviously supposed to be made up of characters who are teenagers. However, it is clear in watching this movie that save for maybe one of the supporting cast, none of the other young cast members are teenagers. On the surface that seems like a bad thing. However on a deeper level, it may account for why each cast member’s performance is, while slightly over-the-top, at least entertaining to a point. None of the performances necessarily pulls audiences into the movie or is award-winning by any means. It is however entertaining enough that collectively, it is just enough to keep audiences watching through to the movie’s finale. Case in point, lead star Lucas Till’s interaction with his CG-rendered co-star. Till is to be applauded for the exemplary job he does of imagining the shark/octopus hybrid is actually in the scene alongside him. That is exhibited in happier and more high-energy moments. Co-star Thomas Lennon (Reno 9-1-1, Night at the Museum 1 & 2) is just as entertaining when he is on camera as geologist Jim Dowd. Audiences will find themselves rooting for Dowd thanks to Lennon’s performance of the reluctant oil company employee who turns out to not be so bad (not to give away too much). Lennon shows through each moment on camera that he understands Dowd is a supporting character and still makes the most of each moment without taking over said scenes. His is just one more way in which the cast’s performance proves to be so important to the movie’s overall presentation. If not for their work (and that of the rest of the cast), the movie’s plot hole and equally problematic setup would be unbearable and would otherwise not make the movie worth watching even for five minutes. The cast’s work on camera, while important is not the movie’s only important element. The balance of the movie’s special effects and live action elements rounds out its most important elements. The balance of live action and computer generated effects used throughout Monster Trucks is the last of its most important elements. As with the work of the movie’s cast, the lack of this element would make the movie’s story even more unbearable, and in turn, the movie overall even less worth the watch. The CG is limited to Tripp’s subterranean pal and its family (or at least they seem like family) members. Audiences will be impressed by this minimalism and the effect of said minimalism on the movie’s look. In a weird way that expert balance actually serves to add to audiences’ ability to suspend their disbelief. That leads to even more ease in watching the movie. When the work put into making the movie look believable is set alongside the work of the movie’s cast, the two elements do just enough to keep the movie’s batteries charged along with those of its audiences. Keeping that in mind, Monster Trucks proves to be an entertaining watch even though it proves to be a movie on which hopefully future models will improve. This entry was posted in Celebrities, DvD's and blu-rays, Internet, Movies and tagged celebrities, Danny Glover, entertainment, facebook, internet, Monster Trucks, movies, Nickelodeon, Nickelodeon Movies, Paramount, Phil's Picks, Rob Lowe, Twitter, Wordpress by philspicks. Bookmark the permalink.